Amazon India has announced the launch of a new payment method for customers using Amazon Pay. According to new information seemingly available only on the company’s mobile app for now, buyers will now be able to pay via ‘Amazon Pay EMI’ that will enable eligible customers to pay via monthly installments using their debit cards without any upfront payment. EMIs will range from between 3 months to 6 months, and the company says it has tied-up with Capital Float for the purpose. Customers of HDFC Bank, ICICI Bank, Canara Bank, Citi Bank and Kotak Mahindra Bank are eligible to make use of the new facility for the time being, but it’s not immediately known if other banks are going to be added to the list going forward. Curiously enough, the Amazon Pay EMI option seems to be currently available only for mobile users right now, with no word on when (or if) it will be rolled out to a wider user-base. 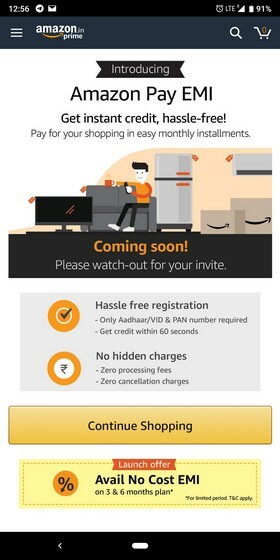 After you complete the setup, Amazon says users can avail an Amazon Pay EMI limit of up to Rs 60,000, even without holding a credit card. It also promises zero processing fees for transactions on the new platform. As per the detailed terms and conditions, the new payment option can be availed only for single-item purchases worth a minimum of Rs. 8,000, and the linked bank account needs to have a sufficient balance to cover the cost of purchase. Customers looking to opt for the EMI option will have to furnish their Aadhaar ID and PAN Number. Do note, however, that the option will not be available when an exchange offer is applied on the purchase. The option will also not be available on jewellery, gift cards and Amazon Pay balance top-ups, while products from Amazon Global Store have also been left out of its purview. Do note that while some customers are ‘Pre-qualified’ for the new payment option, others have to wait for an invitation to use it.